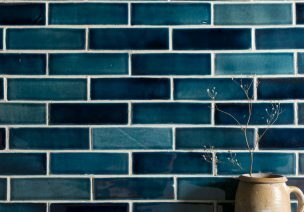 You may have read my blog last year about the expected tiling trends for 2018. Well, I thought I would do the same again for 2019! I have put together a little guide below to what I think we may see quite a lot of throughout this next year in the tiling world and I hope it helps to inspire you for any upcoming projects. Recently we have started to see a huge increase in the number of customers showing an interest and purchasing our larger format tiles, particularly our 600×900 tiles. A lot of people are wanting to open up their kitchen and dining spaces to make a more open plan style of living. I often suggest that if you have a larger room, larger tiles will work much better as they are less fussy, keeping the look of a nice open space. Our two most popular tiles, Dijon Tumbled Limestone and Light Jerusalem Tumbled Limestone are both available in a 600×900 size as well as our free length options which contain the bigger sized tiles. 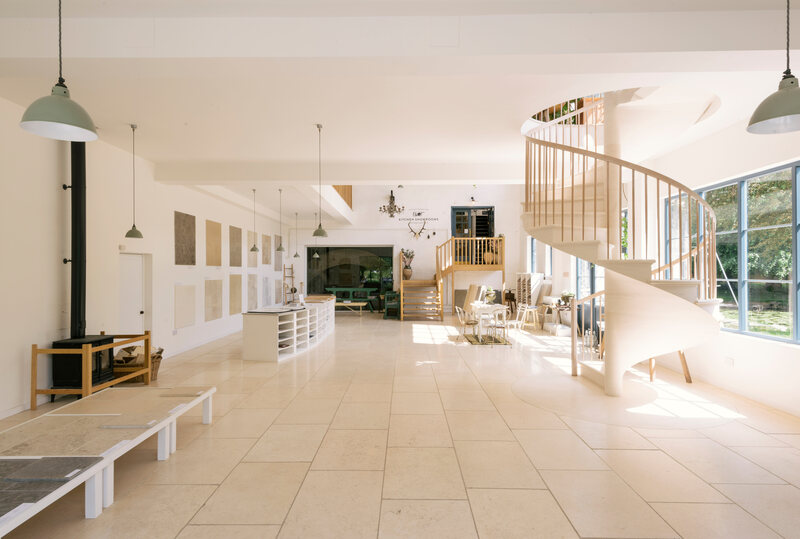 If you have ever visited our beautiful showroom at Cotes Mill you may have noticed the Light Jerusalem Tumbled Limestone laid on the floor throughout and we chose to use the 600×900 as we couldn’t imagine having anything smaller in such a large space! Our Light Jerusalem Tumbled Limestone laid in a 600×900 tile in our showroom at Cotes Mill. As well as limestone, we also stock a number of large format porcelain tiles ranging from a 750×750 tile up to a 1200×600 tile! Porcelain is a great material to use if you are looking for something easier to maintain and with less colour variation. We have a large range of porcelain tiles so please do check these out on our website. 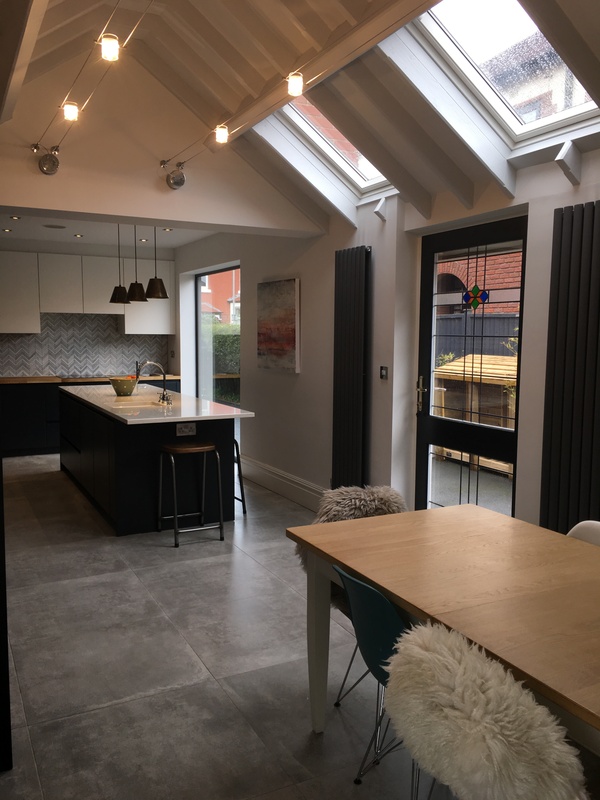 We recently had a customer who laid our Cement Porcelain in their kitchen and living area in the 750×750 size and we think it worked perfectly! Larger tiles also mean fewer grout lines which provides a more seamless finish and looks great in bigger areas. Our Cement Porcelain tiles laid in the 750×750 size in this gorgeous kitchen/living space. We introduced our terracotta tiles back in the summer of 2017 and customers have loved them ever since! Terracotta tiles have been used as a floor covering for centuries but it is only recently, they have seen a resurgence in popularity. In 2018 we had record sales of our terracotta tiles selling 4 times as much as we did in 2017 which really goes to show how many people have fallen in love with them! 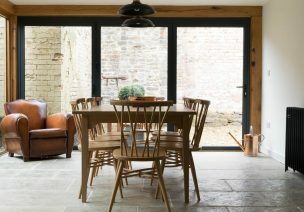 Last year our sister company, deVOL Kitchens, opened up a new kitchen showroom here at Cotes Mill which features our Terracotta tiles throughout the kitchen space and scullery and this space has really helped our customers to visualise how the tiles look once they have been treated and installed. The tiles have been treated with boiled linseed oil and finished with antiqued beeswax to give it an authentic, traditional feel. I have a very sneaky feeling that 2019 will see even more terracotta tiles laid in peoples homes and at £36 p/m2, you really can’t go wrong! 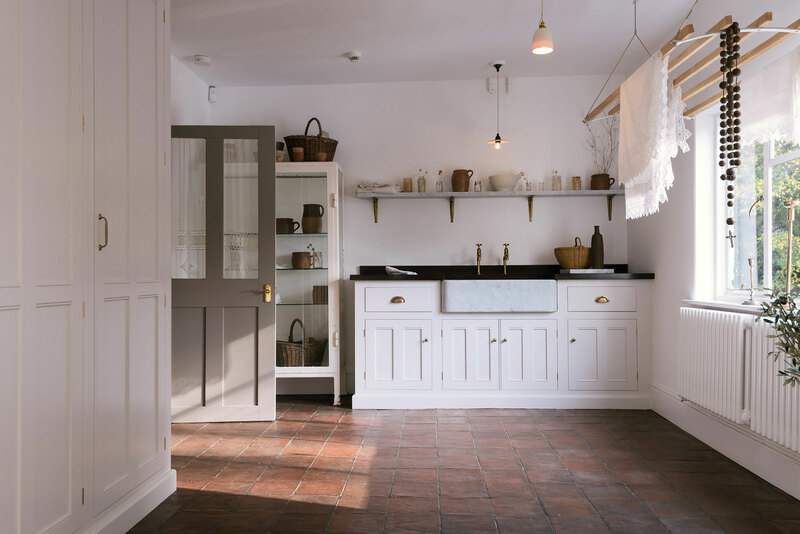 Our beautiful terracotta tiles laid in a deVOL Kitchens showroom at Cotes Mill. Long gone are the days of ‘less is more’ – 2019 is the year of the statement! For many years a lot of people have opted for a simpler style with a soft, muted colour palette but I feel this may be no more! You may have seen across our social media platforms that we recently introduced two new marble tiles; Parisian Chequer Marble and Torrente Polished Marble, both of which will certainly make a statement in your home! 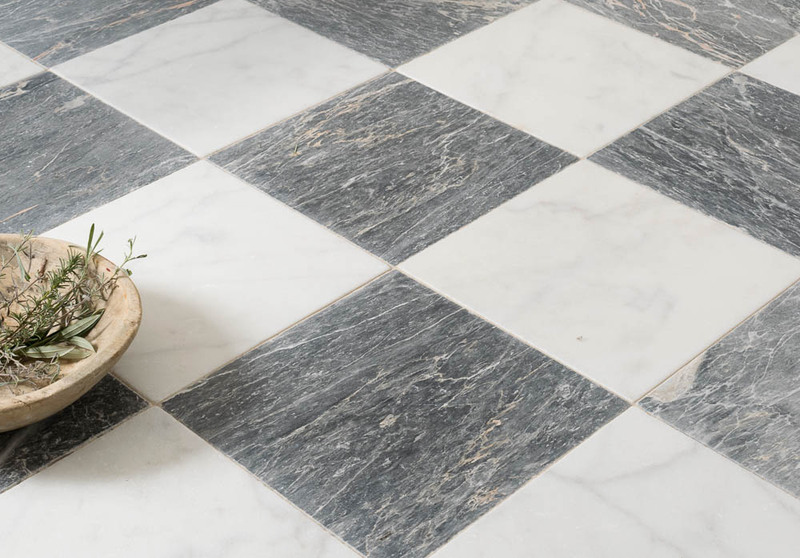 Our Parisian Chequer Marble has been designed to recreate a black and white chequerboard flooring which would have traditionally been used in many homes dating back to the 15th century. 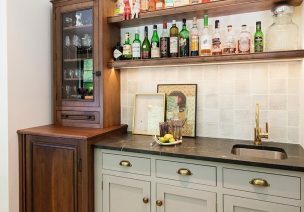 The softly tumbled edges of this marble tile really helps to give the appearance of a reclaimed stone, that you may even mistake for the original flooring. The second tile I mentioned was our Torrente Polished Marble, which again, has been designed to make a statement! 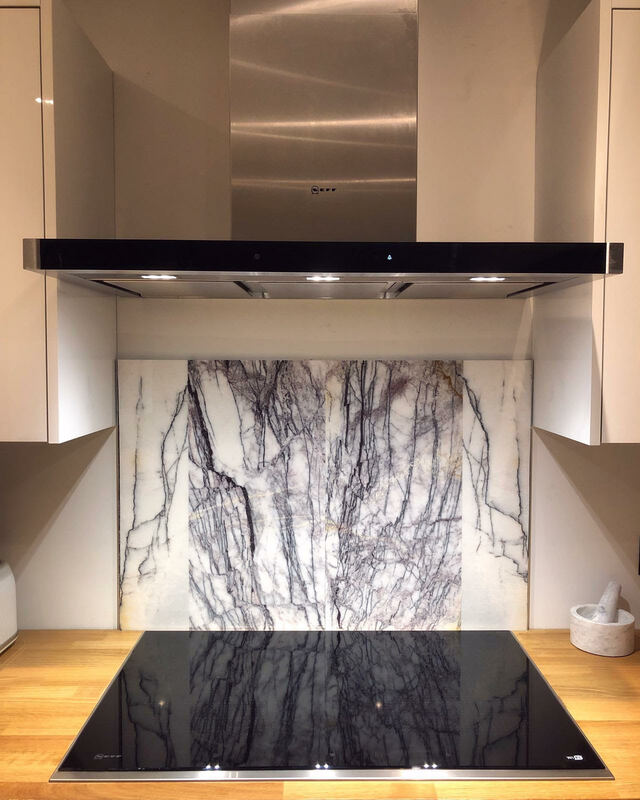 This gorgeous marble tile has a predominately white background with striking violet and amber veins running through and would be a perfect option for use in a bathroom, or for those more daring customers, you could even use it in a kitchen. 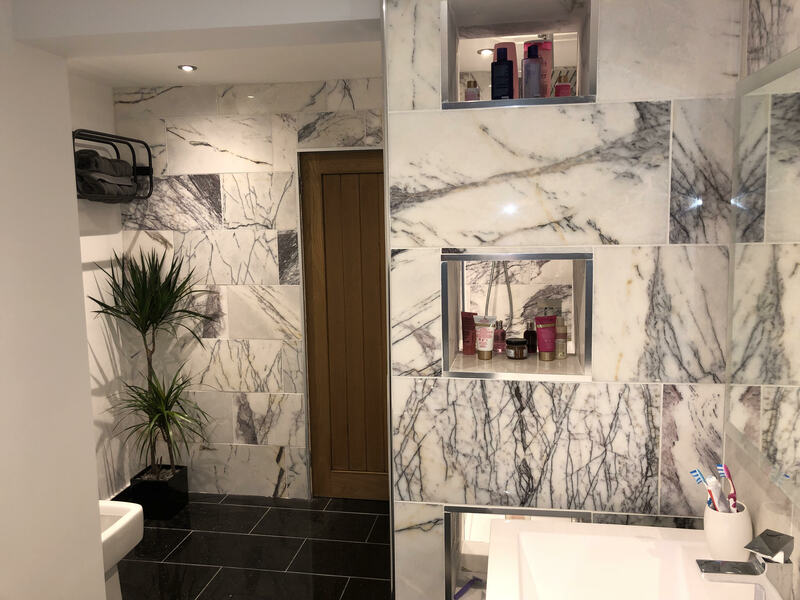 A customer of mine recently purchased some of our Torrente Polished Marble and I received some images from them earlier in the week and the first word that came to mind was ‘wow!’ It has created such a feature in this gorgeous bathroom and they even used a few spare tiles as a splashback in their kitchen! I hope this blog has inspired you for any upcoming projects you have planned for this year and we can’t wait to keep introducing new products to you with more coming very soon! If you have any questions about any of our tiles or if you would like any samples, give our knowledgeable sales team a call on 01509 234000 or alternatively you can email us on enquiries@floorsofstone.com and a member of our team will be in touch.